The capital of the Bahamas is famous as a cruise port but has much to offer honeymooners as well. The more than 700 Caribbean islands that make up The Bahamas are a popular destination for vacationers and honeymooners from the United States and worldwide. Cruise passengers think of Nassau as a stopover for duty free and traditional market shopping as well as a nightlife hotspot. Even though the bars, clubs and casinos have given it a bit of a gritty reputation when compared with the rest of the Bahamas, Nassau is a jewel in itself with beautiful beaches and posh resorts to make your honeymoon a trip to remember. 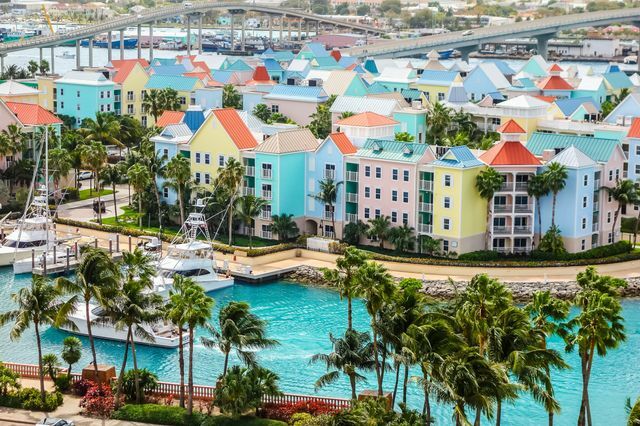 Nassau is the perfect destination for honeymooners who wish to relax on the beach, or take a snorkeling trip during the day, but still be close to nightlife and restaurants. The beaches near Nassau offer crystal clear water and beautiful stretches of white sand with the historic and bustling city is just a hop skip away. Start planning your Nassau honeymoon with the help of this guide. With more than 300 days of sunshine a year, there is no bad time to visit the Bahamas. The weather is great year round and is fairly consistent. To avoid crowds visit between May and October however be forewarned that the hurricane season starts in June. Atlantis Paradise Island: A resort which features an amazing water park, casino, aquarium and more. Blue Lagoon Island: Beautiful private island and popular tourist attraction located near Nassau. Ardastra Gardens, Zoo and Conservation Center: The only zoo in the Bahamas and four acres of lush tropical gardens. Fort Fincastle: An 18th century stone fort and former lighthouse overlooking the city of Nassau and shaped like a paddle-steamer. Fort Charlotte: A British-colonial fort built in the 18th century. Overlooks the city of Nassau. National Art Gallery of the Bahamas: First art gallery in the Bahamas. Displays Bahamian art permanently as well as temporary exhibits. Pirates of Nassau Museum: A replica pirate ship and a museum featuring pirate-themed objects. Athol Island Snorkeling Tour: Catamaran tours to an uninhabited island with lovely snorkeling. Dolphin Cay: Dolphin education center at Atlantis which allows visitors to interact and swim with dolphins. Straw Market: Traditional open air market selling handmade Bahamian crafts, tourist trinkets and other goods. Cable Beach: Popular resort beach and tourist destination. Features clear water and beautiful white sand. Queen’s Staircase: 102-foot tall solid limestone staircase leading to the top of Bennet’s Hill and named in honor of Queen Victoria. Deep Sea Fishing: Several companies offer chartered fishing trips around Nassau. Parliament Square: Buildings include the House of Assembly, Senate and the Supreme Court. Examples of colonial, pink architecture.